Hello ... Hello ... my old friends ... It's great to see you once again! I knew that this much anticipated concert was going to be a winner when, as I settled into my seat, Yours Truly KJS could hear the dulcet tones of The Traveling Wilburys being broadcast from the PA at the Prince of Wales Theatre in Cannock last night [Friday 22nd June]. And Desperado did not disappoint. In a set that traversed the whole recording career of The Eagles, Don Henley and Joe Walsh, this six  piece Walsall based band rocked it up as they not only superbly covered Eagles classics including "Hotel California"; "The Long Run"; "One Of These Nights"; "Lyin' Eyes"; "Life In The Fast Lane"; "Tequila Sunrise" and "Desperado" with rarities "Ol '55" and "Love Will Keep Us Alive" - and not a few others. My faves were the live renditions of "The Boys Of Summer"; "Rocky Mountain Way"; "Life's Been Good" and "Dirty Laundry". This was the last gig for guitarist Steve Gee and he produced a superb display of top quality guitar work which really lifted the bands performance to the next level with many of those Eagles songs given a much rockier edge than this writer expected. And once again the superb, clear vocals of Chris Brighton were again evident - as they were earlier in the year during the debut Spring tour of: The Abbey Road Experience. The whole band were tight, professional and provided a real crowd pleasing tribute to The Eagles. 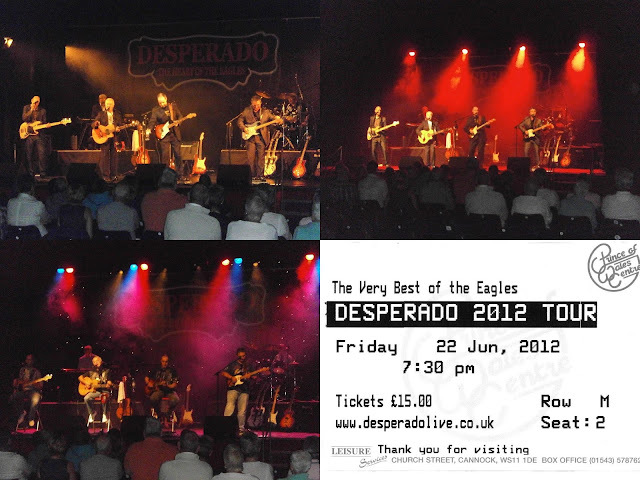 Desperado were Chris Brighton [Guitars/vocals]; Steve Ashcroft [Guitars/tambourine/vocals]; Steve James [Drums/vocals]; Frank Beach [Keyboards/harmonica/vocals]; Mike Tinsley [Bass guitar/vocals] and Steve Gee [Guitars/vocals]. ELO Beatles Forever [ELOBF] recommends Desperado to those enlightened folks who enjoy the music of ELO, Jeff Lynne, Roy Wood, The Move, The Idle Race, 'Brum Beat', The Beatles, The Eagles and related artistes.